You are here: Home » Aloe Aloe Aloe! The answer to yesterday’s Macro Monday was aloe. Although you won’t find them in flower in your gardens (in the UK and Ireland) at this time of year, if you live somewhere free from frost they will be blooming now. 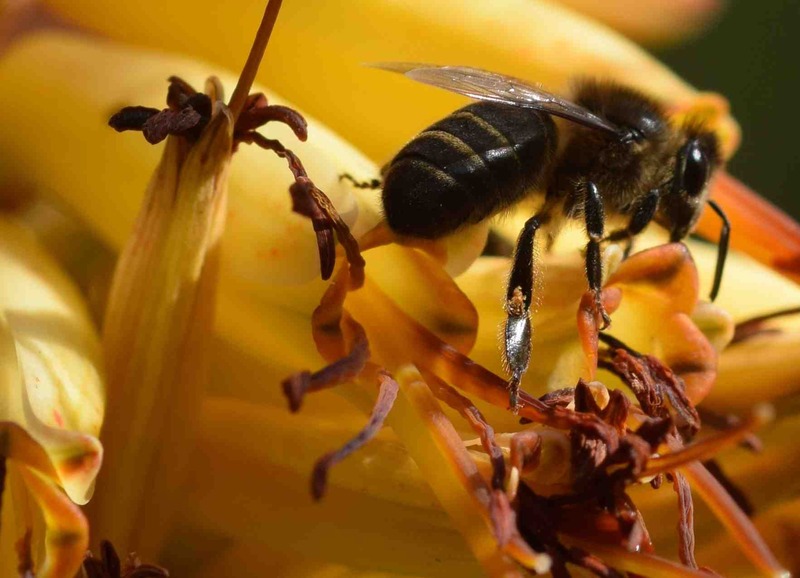 Their flowers are rich in nectar and are pollinated by birds in the wild but bees are not averse to gorging on the dripping sugary liquid either if they get the chance. 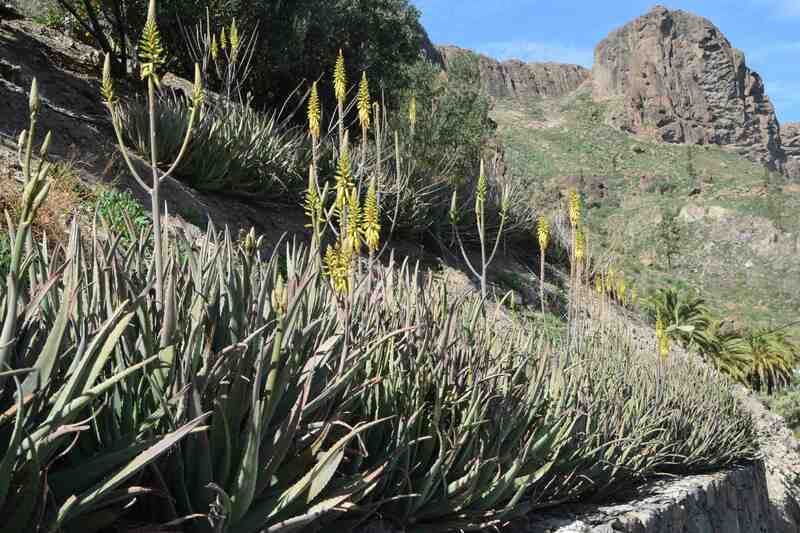 There are about 500 species of aloe and they are found wild in Africa and up into the Arabian peninsula. 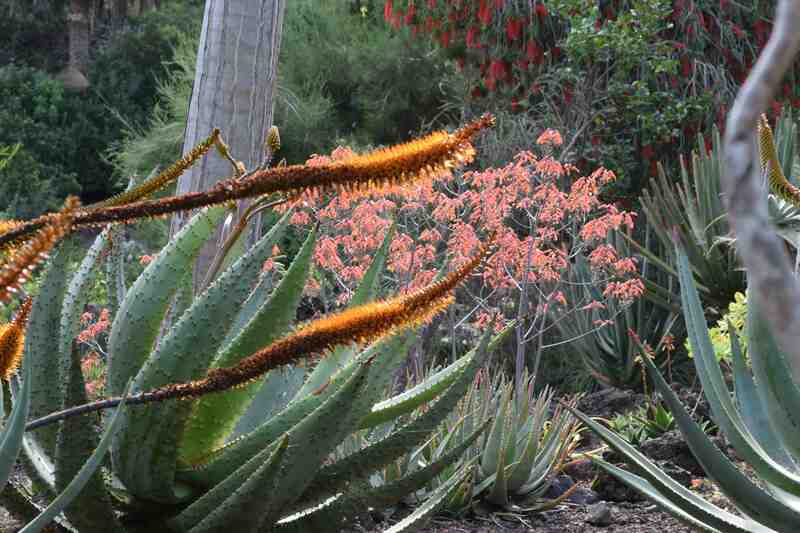 They used to be in the lily family but recently that was split up into many smaller (to me almost incomprehensible) families and now aloes are in the Xanthorrhoeaceae. Aloes are succulent plants, either stemless or with woody stems with alternate leaves that spiral around the stems or to make rosettes. The leaves can be smooth, toothed around the edge or spiky on the surface. They can form ground hugging clumps or tree-like trunks. In all cases they have tubular, six-petalled flowers that are often deeper in bud, often facing upwards, and paler when the flowers are open and usually pendent by that stage. In these ways the flowers are very similar to kniphofias and I must admit that I struggle to work out the differences. Kniphofias (also in the Xanthorrhoeaceae) are largely herbaceous, though K. caulescens and K. northiae are two hardy species that form trunks, and they can be evergreen or deciduous. Aloes are evergreen and always succulent and I think that this succulence is the main difference although that seems slightly arbitrary to me. Both are found wild in the same areas although kniphofias are found in moisture places. 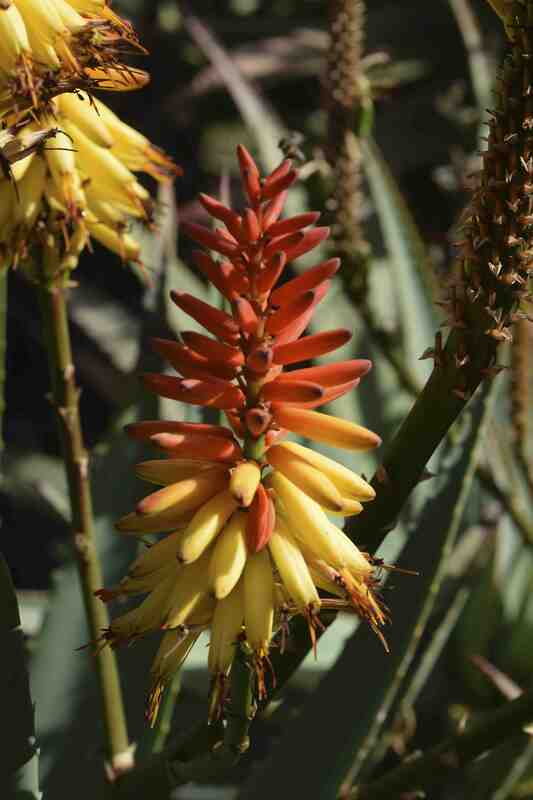 Aloes have been used in medicine for centuries and the bitter chemical Aloin has been used as a purgative. Processed aloe juice does not contain this. 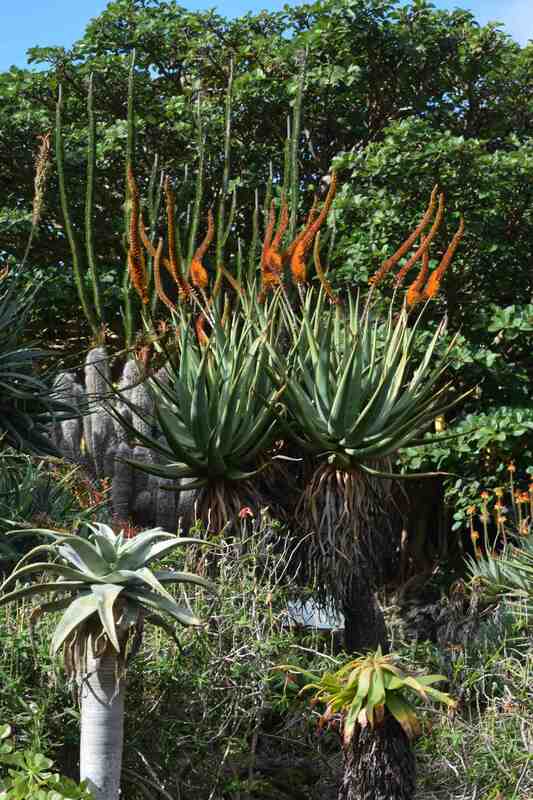 The most famous aloe of all is Aloe vera (or ‘true’ aloe) (also known as Aloe barbadensis) – see below. This is cultivated in frost free climates as an ornamental and for its sap and it makes a decent potplant in colder climates. The juice in the leaves is commonly used to treat burns and, increasingly it is consumed as a dietary supplement. I even buy aloe vera drinks but apparently there is little conclusive evidence that it does any good and excess amounts might be toxic. But, based on the idea that a wide range of foods is best, a little of it can’t be doing me any harm – can it? You had me fooled. Lovely photos.